This tutorial will show you how to add the filenames of the images to the slides. Add the images to the slide show. In the "Text" tab of the "Slide Properties" window, Click the "Add" button to add a new text item. By default the text will be "New". Select the text item from the list and change the text below in the "Properties" area to %filename. 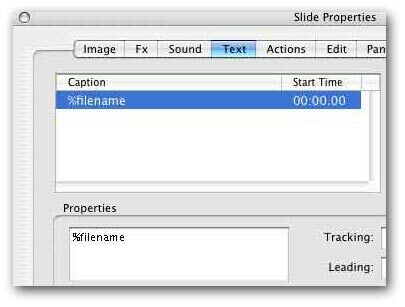 When the slideshow is exported/previewed, anywhere %filename is found in the text for any slide, it will be replaced with the actual filename of the slide without the extension. Please note this will only work for text added in the "Slide Properties" and not the "Slide Show Properties" window. 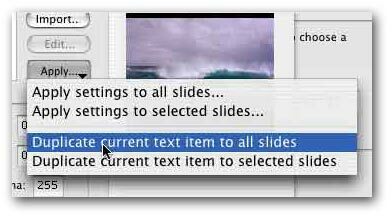 If you want the filename to be displayed for every slide, you can choose "Duplicate current text item to all slides" from the "Apply" menu button. Your slides should now display the filename.